Italy - Over 2,000 migrants have died so far this year trying to cross the Mediterranean to reach Europe, confirming this as the deadliest route for migrants in search of a better life. In the same period last year, 1,607 migrants perished. A total of 3,279 lost their lives in 2014. As in 2014, the overwhelming majority died in the Channel of Sicily on the Central Mediterranean route connecting Libya and Italy, where unseaworthy vessels used by smugglers and traffickers significantly increase the likelihood of tragedies occurring. Statistics suggest that the Central Mediterranean route is far more dangerous than other routes. While Italy and Greece have this year experienced similar inflows of migrants (approximately 97,000 and 90,500 respectively), the death rates are very different. Approximately 1,930 people lost their lives trying to reach Italy, but only about 60 died trying to reach Greece. The latest tragic loss of life which took the total number of deaths past 2,000 took place last week when a total of 19 people lost their lives in the Channel of Sicily. The remains of 14 of the migrants were brought to the Sicilian port of Messina on July 29 by the Irish Navy Ship Le Niamh. They were part of a larger group of 456 people rescued at sea. 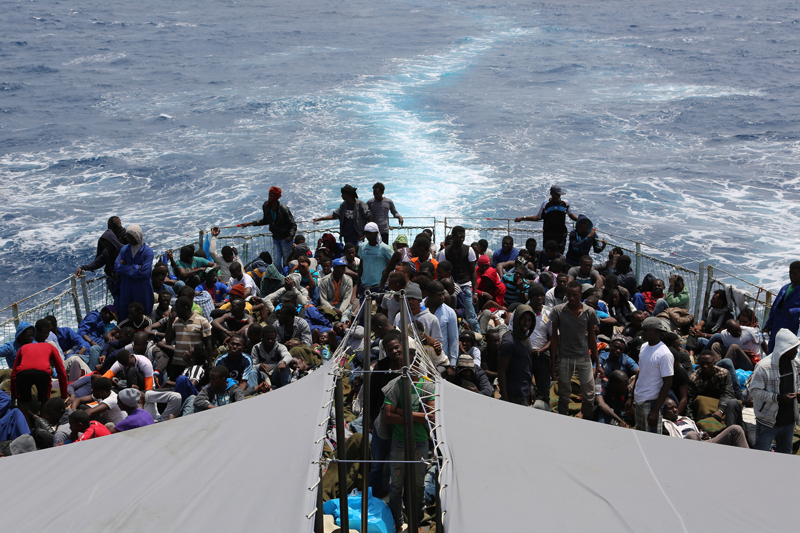 According to IOM staff in southern Italy, who interviewed the survivors, the engine of the boat in which they were travelling overheated and the drinking water on board had to be used to cool it. Fourteen migrants subsequently died of heat exhaustion and thirst. “It is unacceptable that in the 21st century people fleeing from conflict, persecutions, misery and land degradation must endure such terrible experiences in their home countries, not to mention en route, and then die on Europe’s doorstep,” said IOM Director General William Lacy Swing. Despite these tragedies, IOM recognizes the extraordinary efforts of maritime forces in the Mediterranean, who continue to save migrants at sea on a daily basis. Loss of life has been greatly reduced in recent months and this is largely due to the enhancement of the Triton operation, which can now count on more vessels patrolling international waters, where most migrants run into difficulties. Approximately 188,000 migrants have been rescued in the Mediterranean so far this year and IOM strongly supports the continuation of this level of response. The organization believes that more migrants will attempt to reach European shores as the summer progresses, and the 200,000 mark will be reached very soon. Meanwhile, in a related and equally tragic event, media yesterday reported the death of a 27-year-old Moroccan man, who suffocated when hidden in a suitcase. He was in the trunk of a car on a ferry travelling from the Spanish North African enclave of Melilla to southern Spain.